For the past month or so I have been playing with Microsoft's Popfly.com Game Creator. While learning my way around the controls I created some games. I have decided to share my games on my site here by creating a Game Gallery. As I create a new game I will post about it here and add it to the gallery. I don't know how often I will create a game nor what kinds of games I will work on. I do hope to post a game every month or two but if you follow my blog you know I can vanish for months at a time due to personal life issues and not get back to posting or working on these hobbies until there is time for them. 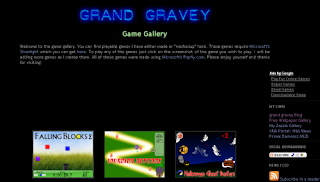 Anyhow, without further ado, check out the Free Games Gallery. I will be posting more about the games, using Popfly.com, and other things of this nature in the near future. If you have any requests or ideas for types of games you would like to see in the gallery, please leave it in a comment.